Although best known as a beach resort, Puerto Vallarta is one of the most versatile adventure travel destinations in the world. Nestled between the jungle-covered Sierra Madre Mountains and the sheltered waters of Banderas Bay, this region's geographical diversity offers an extremely wide variety of natural attractions and outdoor adventures. 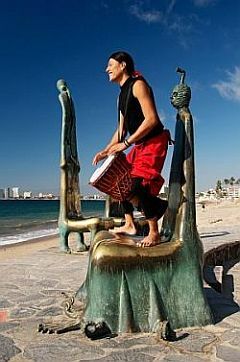 Unlike many other popular beach vacation resorts, Puerto Vallarta is actually several destinations in one. Situated on the Pacific Coast of Mexico just south of Baja California, the Banderas Bay area offers more than 34 miles of incomparable coastline in the states of Jalisco and Nayarit - and innumerable activities that are affordable and easily accessible. For those who just want to relax, miles and miles of beautiful golden sand beaches offer one of the best ways to experience the beauty and magic of the Bay of Banderas. And with 322 days of sunshine annually and an average temperature of 80 degrees F, Puerto Vallarta is one of the few places on Earth that can boast an "ideal" climate for sun worshipers. With picture-perfect weather and extraordinary natural beauty, outdoor recreation around the bay is limitless. Traditional sports like golf and tennis are unforgettable. This region is one of Mexico's leading golf destinations with golf courses designed by some of the world's greatest golfers including Jack Nicklaus, Tom Weiskopf and Robert von Hagge. Puerto Vallarta is also a major tennis destination with a growing number of tennis clubs, classes, workshops and tournaments each year. Swimming, snorkeling, scuba diving, kayaking, sailing whale watching and sportsfishing await you in the warm, clear waters of Banderas Bay and the Mexican Pacific. On land you can explore the Sierra Madre Mountains and jungles on an exciting excursion provided by one of the area's many professional tour operators. If you prefer to do a little exploring on your own, the quiet pleasures and local colors of Mexico are waiting to be discovered in a variety of unique and inviting fishing villages and beachside retreats. A recent Travel and Leisure Magazine Readers' Survey listed Puerto Vallarta as the number one beach destination in Latin America because of the wide variety of beach communities and sleepy seaside villages around the bay. During your stay, be sure to explore these towns and enjoy a genuine taste of the real Mexico. Semana Santa, the first week of the Easter vacation period, was one of intense activity for Puerto Vallarta Civil Protection and Fire personnel who, from April 13 to 21, 2019, provided 11,796 prevention services, 315 emergency services, and 16 water rescues. The Riviera Nayarit is ready to welcome the third edition of the RHA Festival, the much-anticipated, two-day, electronic music festival that will bring the best of the best in house music from around the world to the La Cruz de Huanacaxtle Marina, on April 26 & 27, 2019. Since today is Earth Day, an annual event celebrated worldwide to demonstrate support for environmental protection, the Riviera Nayarit is highlighting several luxury resorts that are committed to protecting the Banderas Bay region's natural environment year-round. Scheduled to be held in the beachfront garden at the Marriott CasaMagna Resort on May 5, 2019, the 15th Annual International Altruism Festival promises to deliver a wonderful mix of charity, culture, entertainment, food and fun to Puerto Vallarta residents and visitors. Personnel from hotel members of the Bahía de Banderas Hotel and Motel Association are prepared for the upcoming Easter holiday season after taking an intensive Lifeguard training course taught by the Civil Protection and Fire Department of the State of Nayarit. This summer, ultra-low-cost airline Volaris will begin two new flights to the Puerto Vallarta International Airport - one from Phoenix, Arizona, and another from Querétaro, Mexico. Twice weekly service to and from both destinations starts on June 16, 2019.